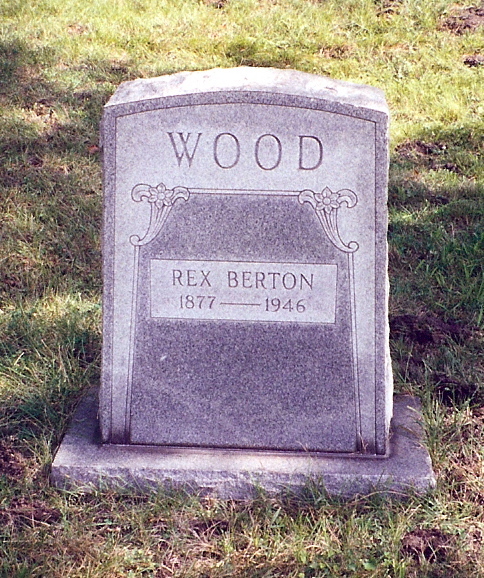 Among the more than two hundred and sixty graves in Bethel Lutheran/Miller Cemetery lie the remains of Rex Berton Wood, one of the most well-known American experts of the game of checkers in first half of the 20th century. If you think checkers is just a kids game, think again, scroll down for more on that. Be sure to check out the companion page to this one: a scrapbook of articles. Rex Wood on his 60th Birthday published in the March, 1937 Our Checker Player shortly before he retired from the steel mill. 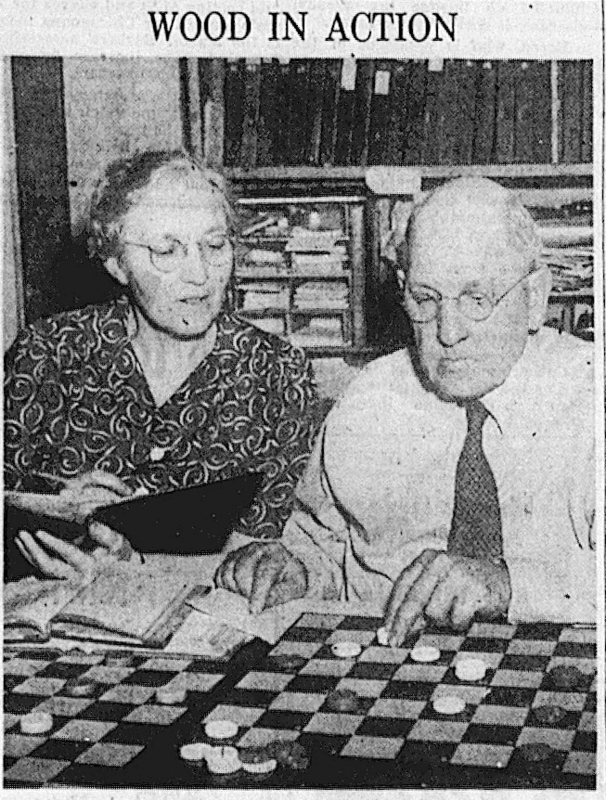 From his modest house at 631 Elkhart street in Miller Rex published pamphlets and newsletters about the game of checkers that were sold by mail around the world for two decades. An efficiency expert, production supervisor and foreman at U.S. Steel, he began playing checkers in 1892 when he was 15. In 1911 he published news about checkers, clippings from newspapers around the country, in Rube’s Checker Clipper. While a short–lived publication, as was his Indiana Checker Bulletin published for the Indiana Checker Federation in 1931, his career as a checkers maven really began in 1934 with Wood’s Checker Studies published monthly in nine volumes totaling 350 pages until it was succeeded in 1936 by Wood’s Checker Player. Besides the publications he produced himself, he sold books like William Ryan's Scientific Checkers Made Easy. The inside cover of the May, 1939 issue of Wood's Checker Player lists 27 books and publications you could order from him. The first issue of Wood’s Checker Player came out in December of 1936 and like Studies was nine volumes, the last being Volume 9, No. 12 in September of 1946, six months after his death. It was also called Our Checker Player. The last issues were no doubt published by his wife Paulean, who continued to sell books from their home until the mid-1970s when she move to Texas, dying in 1978. In the mid-1930s Rex began the longest running mail play checkers “ladder” in the game’s history. “Wood’s Ladder” eventually settled in as a regular feature in the Bulletin of the American Checkers Federation. 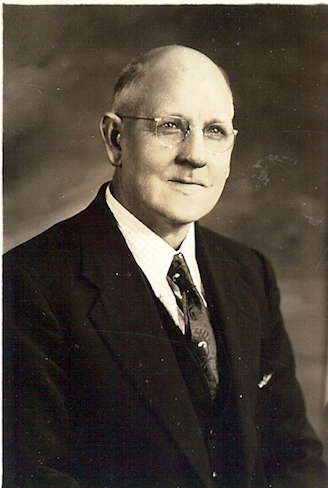 This photo of Walter Hallman courtesy of the Online Museum of Checkers History was published in the Sept. 1935 issue of Wood’s Checker Studies. It is likely his Emerson High School photo. While Rex Wood won the Indiana State Checker championship in 1929, he was not the avid player his review editor was. 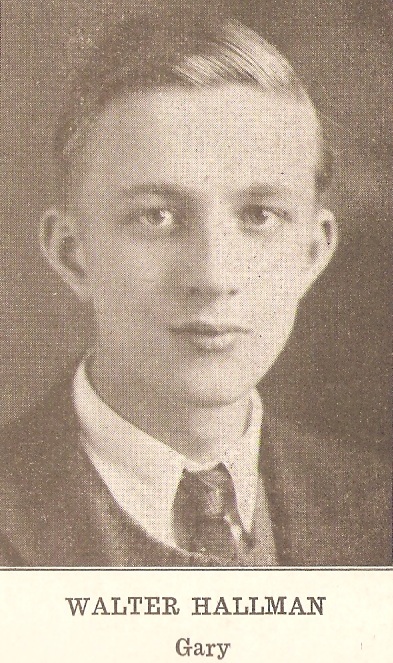 Walter Hallman, a Swedish immigrant born in 1916 was a 17 year old Emerson High School student when he won his first checker championship in 1933. He continued to reign as State champion in the 1930s. In 1948 he defeated Asa Long 2-1-47 to become the new (3-move) World Champion, Walter Hellman reigned longer than any other American as World Champion, he held the title from 1948 to 1955 and again from 1958 to 1975, the year of his death. He lost only one World Championship Title Match, in 1955, to Marion Tinsley. He is memorialized on Find-a-Grave.com. Emerson graduate. Gary Steel worker. He changed his name to Hellman during World War II given the German nature of “Hallman,” However, you will find both spellings used in publications after the war. More about Walter Hellman from newspaper clippings. 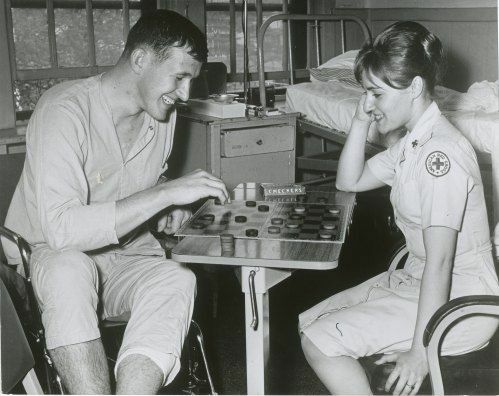 Recovering World War II soldier playing checkers with a Red Cross volunteer. The golden age of checkers, or draughts, playing is long over, supplanted by TV in the 1950s and then the proliferation of video games. It is debated whether checkers is a “poor man’s chess” and which is tougher. Chess players will say checkers is tougher; checkers players will say chess is tougher. But I would submit that trying to master the game is just as difficult as trying to master chess. As one checkers master has said, “Checkers is so simple a child can play it and so complex that no adult could ever master it.” There are roughly five hundred BILLION BILLION possible checker positions on the 8 x 8 board. As for comparing chess and checkers, I can’t do any better than Joe Moore’s essay, Checkers vs. Chess. While Rex began writing and publishing about checkers as early as 1911, he is perhaps best known for his Wood's Checker Studies which was followed by Wood's Checker Player published monthly for ten years from 1936 to 1946. Rex B. Wood, who died today, had plenty of help from Mrs. Wood in publication of his magazine for checker players. Here the noted expert in the game is shown with Mrs. Wood in their home at 631 Elkhart, in a picture taken a few months after they marked their 25th wedding anniversary in October, 1941. 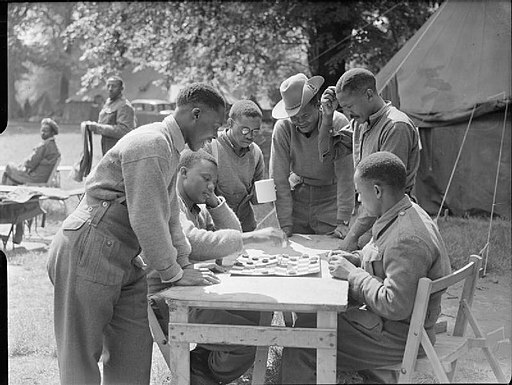 Wood was internationally known for his magazine which covered the United States and Canada and was sent during the war to spots all over the globe where checkers enthusiasts kept up with the game while at battle stations. He won the Indiana championship in 1929. Married three times. Eight children. Steel mill foreman. Married once. Survived by his wife, four daughters and one son. Steel worker. * Elkhart street is the north-south street just west of Kidstuff Playsystems on Miller Ave. This webpage could not have been created without the help of Jay Hinnershitz, the creator of the incredible Online Museum of Checkers History. Many thanks to him. Also used were Newspapers.com and the resources of the Genealogy room of the Lake County Library. Created September, 2018 - Steve Spicer Feedback and contact.